I'm inclined to use the term oolong when writing about green oolongs and reserve wulong, the Mandarin translation, for dark oolongs. Wulong means black dragon. Taiwanese high mountain oolongs tend to be on the greener end of the oolong spectrum. 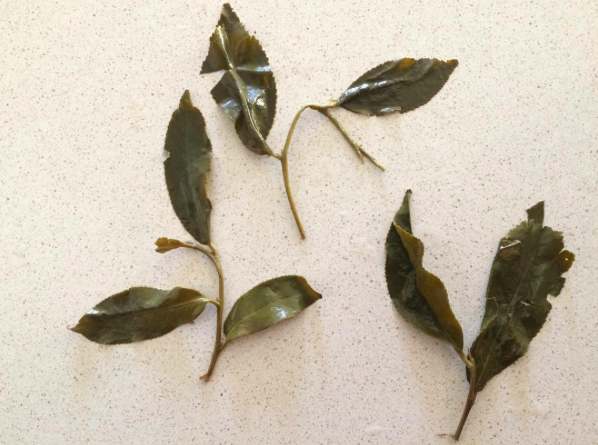 After reading Alexsia of My Thoughts Are Like Butterflies drool-inducing reviews of Floating Leaves Tea 2016 high mountain oolongs, I purchased a sampler of Alishan, ShanLinXi, Hehuanshan, Lishan, and DaYuLing. No doubt you have seen my photos on Instagram. I will drink the teas in the order listed, recommended by Shiuwen, to travel up the mountain. Today I present my notes on the Alishan. I will start my review with my conclusion: this oolong was a pleasure to steep and to drink. The tea was harvested in May 2016 from the Zhang Shu Hu area of the mountain from Qin Xin cultivars. The tea is tight balls of olive and forest green leaves. There were stems present. I prepared this tea a couple of ways but will discuss the most aromatic session (session 2). I used 8g and infused the leaves for 2x10s, 2x12s, 2x15s, 2x17s, 2x30s, 2x30s). The rinse leaves were sweet and creamy smelling like the dry leaves but with the addition of vegetal and herbaceous notes. The first two infusions were creamy and sweet with a green note. I can't be more specific about the green note. A floral note emerged from the second two infusions. I want to say it was rose, which is what I detected as soon as the hot water hit the leaves in the fifth infusion of 35s during session 1. The body of the golden yellow liquor was fuller in the second two infusions. It was more velvety and conjured up the experience of biting into ripe summer fruit. The third two infusions yielded an even more flavorful liquor. The fourth two infusions were less velvety in texture and creamy in flavor but the floral note persisted. The fifth two infusions were very flowery with a backnote of pine. I wonder if my pine is the "bright citrus note" that Shiuwen detected. The tea had faded significantly by the sixth two infusions but retained its floral note. The liquor was smooth with a bit of a drying effect. I wanted to mention that during session 1, on the fourth steep of 20s, the liquor tasted like the smell of the hairs on a tomato stem. Is that weird? I googled "tomato plant smell" and this blog post was one of the more interesting things I read. Finally, if you buy this oolong, do not discard the leaves after your hot water steeping session. Cold steep them. The liquor the next day is delicious! I love a good oolong, but I can't say that I've ever cold steeped it before! Definitely something to do the next time I pull out some oolong to steep. Hello, Michelle. If I don't have more time or if the tea is fading with my steeping parameters, I typically cold steep the leaves overnight and usually the liquor is really interesting to drink.